McLaren's Jenson Button said he was "disappointed" by team-mate Lewis Hamilton revealing confidential information about telemetry on Twitter. 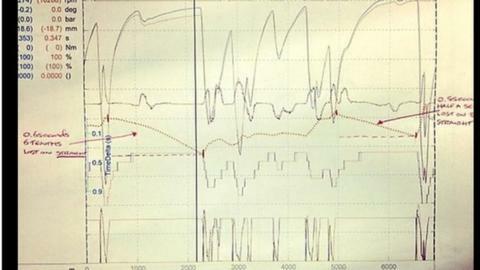 Hamilton posted a picture of data from his and race winner Button's qualifying laps before the Belgian Grand Prix. McLaren said it had not done "much damage" but, when asked how he felt about the incident, Button said: "I'll say disappointed. "We work so hard to improve the car and to keep things like that private." Hamilton was asked to take down the tweet by his team, which he did, but the information revealed ride heights as well as braking and acceleration rates. McLaren will not be taking any disciplinary action against Hamilton, who was attempting to show the difference between a rear wing being used by Button against the one he had chosen for qualifying. "I think it's done now," said Button, who qualified in pole position compared to Hamilton's seventh spot. "I don't think it's for me to be angry with Lewis because it's not a personal thing. "The bit about him losing 0.6 secs on the straights isn't the bit that's important to me because he should be gaining it back in the corners he's got more downforce on. And I was 0.8 secs quicker in qualifying anyway. "It's more the information that we work so hard to keep secret and private, that was the thing I didn't want to see on Twitter."